A simple appetizer perfect for tailgating at your favorite football game. Bake Tyson Crispy Strips according to package directions and cut into small bite size pieces. 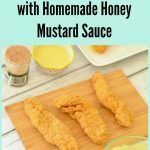 Wisk together all ingredients for honey mustard sauce in a small bowl and set aside. When ready to assemble, place a small amount of honey mustard sauce on top of a mini-cornbread muffin. Top it with a small piece of a crispy strip. Secure with a toothpick. Drizzle more honey mustard sauce on top.